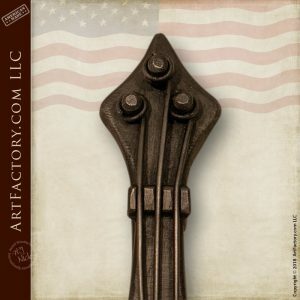 At ArtFactory.com, our custom made, medieval rebec door knocker is created from solid wrought iron and hand forged by our master blacksmiths. We can design custom door hardware for you in any style, or theme that you choose. A custom door knocker allows you to great your guests and neighbors with a piece that uniquely reflects your personality and accomplishments. This customer chose to have us create a door knocker in the shape of a rebec, which is a stringed musical instrument that was popular during medieval and Renaissance times. 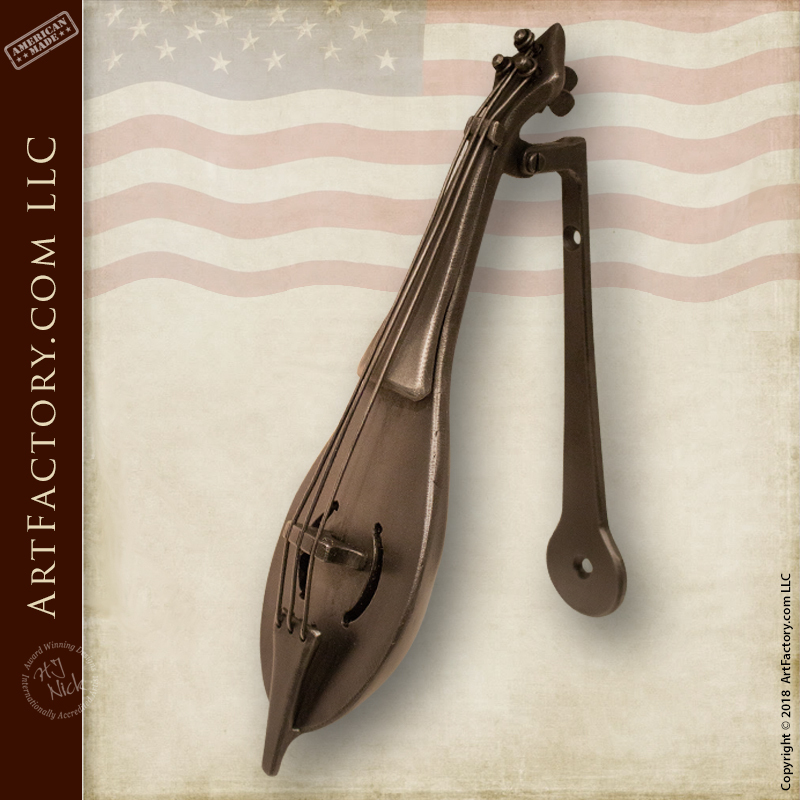 The rebec is played with a bow, can have anywhere between 1 and 5 strings, and was a precursor to the modern violin. Our master blacksmiths have hand hammered the knocker into this unique, correct to scale, one-of-a-kind design. If you are a music lover or are customizing a medieval style door, then the medieval rebec door knocker is the perfect piece to turn your entrance into something extraordinary. 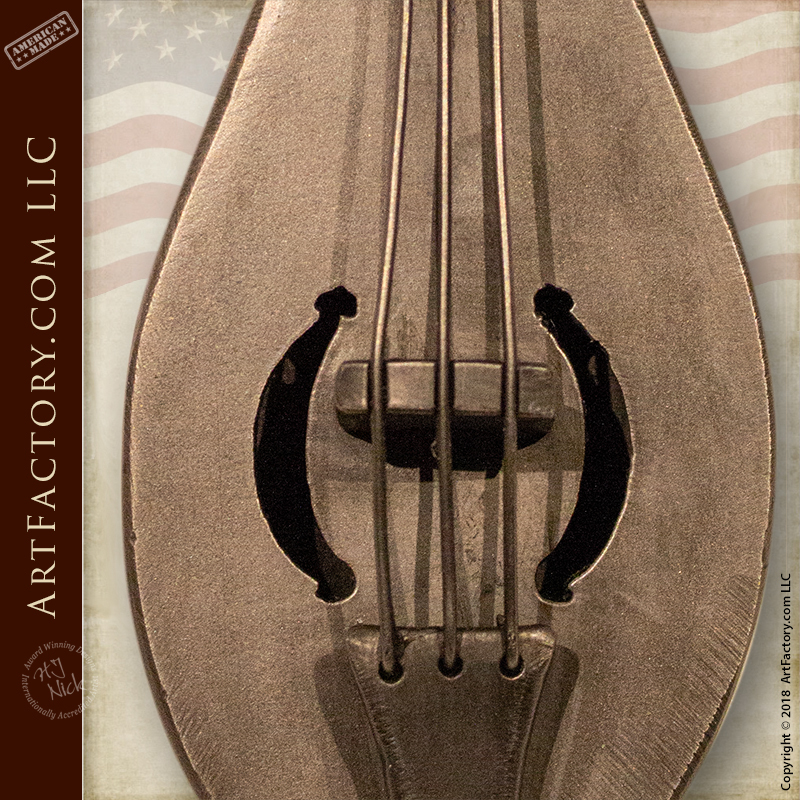 We can also customize a door knocker for you in the shape of any musical instrument of your choice. 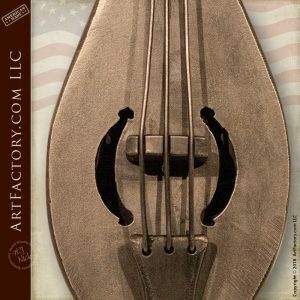 In fact, at ArtFactory.com your customization options are truly unlimited. That means any size, and shape, any style. Most importantly, every hardware product that we sell is a individually created by our master blacksmith from solid, hand forged wrought iron, and guaranteed to last forever. We build all of our custom door hardware products from wrought iron, because unlike other metals, wrought iron doesn't corrode with exposure to the elements. Additionally, when we say hand forged, we mean hand hammered over a coal fired forge by master blacksmith. Our hardware products are never cast, drop forged, or built from a mold. Furthermore, our products are never mass produced meaning that your medieval rebec door knocker is a one-of-a-kind piece that will never be exactly reproduced. Furthermore, all of our genuine wrought iron hardware is finished with a hand applied, iron oxide, advance patina. This patina is heat applied at over 1000 degrees Fahrenheit so that it will infuse to the metal. What this means is a finish that will stand the test of time and look better with age. Our finishes will never crack, flake, or fade like powders and paints. To top it all off, every product that leaves our factory is certified to meet all world class fine are specifications by award winning artist H.J. Nick. This certification and signature ensures you of a product that is of investment quality, and will have future appreciable value in antiquity. Call us today at 1-800-292-0008 for a quote on any of our fully custom products today.